During the period stretching from the 1970s through the 1990s, Monthly Review, under the editorship of Harry Magdoff and Paul Sweezy, stood apart in its analysis of the tendency to economic stagnation in advanced capitalism and its view that the economic slowdown beginning in the 1970s was a manifestation of this secular tendency. The financial explosion that also emerged in these years was seen as an attempt by the system to stave off stagnation by means of credit-debt expansion, but at the cost of increasing financial fragility. 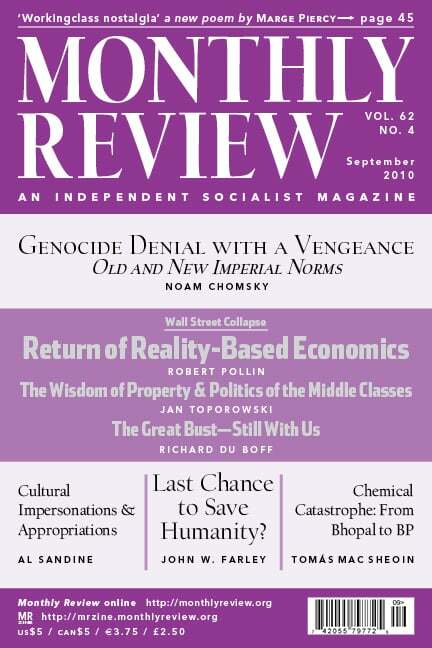 Yet, despite the supreme confidence of the MR editors that historical experience would, in the end, overcome entrenched beliefs, and notwithstanding a decline in the economic growth trend in the mature capitalist economies that has lasted for four decades now, serious consideration of the stagnation problem has been very slow to emerge, even on the left. The main reason for this is, no doubt, the continuing financial explosion during this entire period, which lifted the economy by means of one bubble after another. Profits soared (along with debt) even as production slowed. The depth of the problem was therefore hidden from most economic analysts who didn’t look beyond the bottom line on corporate balance sheets. Caught up in the financial ebullience and trusting in their own abstract models, orthodox economists were impervious to the structural weaknesses of the underlying “real economy.” They even began to talk once again in the late 1990s and in the early 2000s—as they had in the late 1960s and the late 1980s—of the end of the business cycle. The Great Financial Crisis, however, has had the effect of stripping away all such illusions. In an interview on National Public Radio on July 3, Lakshman Achuthan, director of the Economic Cycle Research Institute, stated the obvious (though seldom acknowledged outside these pages) fact that the United States and other capitalist economies have been slowing down for decades: “Ever since the 1970s,” he observed, “the pace of economic expansion in the U.S. has been stair-stepping down, getting weaker and weaker. And the last expansion was the weakest expansion since World War II on every single count.” Representing a more orthodox standpoint, the Economist on June 24 raised the specter of “a long period of stagnation” in Europe and the United States resembling Japan since the early 1990s. We certainly do not want to exaggerate the extent to which mainstream economic observers at this point have come to appreciate the stagnation problem or recognize its relation to the financialization of the economy. The above-mentioned comments represent mere glimmers of understanding. The dramatic rethinking necessary in this regard is still in its infancy. The root of the problem in the accumulation process of mature, monopoly-finance capital is scarcely suspected within the neoclassical economic mainstream, whose entire conceptual apparatus inhibits it from addressing such questions. Yet history is teaching its own lessons, and is not to be denied. In Achuthan’s estimation, the current recovery that began a year ago is already losing ground before having gained steam: “Along with the U.S. economy, the global economy in terms of growth rates is turning back down. And we’re doing it in a fairly synchronized manner. Pretty much every country around the world is going to see its growth rates start to throttle back.” If this is correct, as seems likely, then economic stagnation will become a subject of growing inquiry in the coming year. For those who are approaching this question for the first time, the best introduction, as well as the most sustained analysis of the whole problem, we believe, is to be found in Paul Baran and Paul Sweezy’s Monopoly Capital (1966) together with the joint work of Magdoff and Sweezy—in five books that represent a running commentary on the developing stagnation tendency (and the financial bubbles to which it gave rise): The Dynamics of U.S. Capitalism (1972), The End of Prosperity (1977), The Deepening Crisis of U.S. Capitalism (1981), Stagnation and the Financial Crisis (1987), and The Irreversible Crisis (1988). An attempt to bring the story up to the present crisis is to be found in John Bellamy Foster and Fred Magdoff’s The Great Financial Crisis (2009). A more accessible analysis of the current crisis is to be found in Fred Magdoff and Michael Yates’s The ABCs of the Economic Crisis (2009). All are available from Monthly Review Press. Basil Davidson, the noted British journalist and historian of Africa, died on July 9 at age ninety-five. Davidson wrote for Monthly Review in its first year of publication, 1949, and continued to do so into the 1980s. His role as a British special operations officer aiding the resistance forces under Tito in Yugoslavia and the partisans in northern Italy in the Second World War was later recounted in his brilliant memoir, Scenes from the Anti-Nazi War (Monthly Review Press, 1980). As reviewer John Ellis wrote in the London Review of Books, “The true purpose of this marvelously original book is to remind us that [for the underground] the Second World War was above all a political, even a revolutionary, experience, in which liberation was not simply a matter of driving out the Germans but also involved a radical restructuring of whole societies.” Davidson, however, achieved his greatest fame as a journalist, covering the liberation struggles in Africa, and as a renowned historian of Africa—the subject of most of his thirty-five books. Among his final works was The Black Man’s Burden: Africa and the Curse of the Nation State (1992).